Prologue: Home is the Sailor. I’ve just spent a week in Ireland and I’ve been meaning to write/blog about my adventures on the green island since I got back. Yet, I’ve been busy with work and somehow, my mind’s also been occupied with other things and stories that want out. Today, I finally have some time (or rather: I’m simply taking some time) to write and maybe, I can find a way to get it all out – I’ll try to let all the stories out at once and hopefully, they will get along with one another and peacefully play together without kicking, screaming, pinching and without me sending them into a far corner of my mind to take a time-out or call in a writer-story conference. I’ve always suffered from a chronic disease: cabin fever. The prospect of traveling – anywhere, really – has always had a soothing effect on my usually uneasy self. I love plane rides, train rides, even bus rides and bike rides. Next to ocean shores and mountains, bus and train stations and also airports are probably among my favorite places in the world (at least whenever I get to go somewhere or meet someone – seeing someone off is probably one of my least favorite things in the world, but that’s a different story). When I checked in my – apparently impressively small – bag, I felt as calm as I hadn’t felt in a quite a while. Especially knowing that this feeling would probably last the entire week – because what’s there to see in Ireland? Exactly. Ocean shores and mountains. And sheep. Many, many sheep (Bah bah baaah – that’s “I love Ireland” in Sheep; yes, I’m fluent). Like most people, I have many habits. I need my coffee in the morning, I buy more books than I could ever read and I prefer to fall asleep to music rather than plain, dark silence. None of these are too bad (in my opinion). Another habit of mine, though: I smoke. I’m not a chain-smoker, at least, but still. I’m a stress-smoker. And I have been smoking way too much in my opinion, all through August and September, because I was stressed. Which is not an excuse. I’d like to kick the habit. I’ve heard it’s easier to kick any habit when you change your general routine. I didn’t touch even one cigarette while being in Ireland nor did I feel like it – it seems almost blaspheme to inhale cigarette smoke while being surrounded by sea air all the time. That being said, I’m back home now and general routine’s been rearing its ugly head since I got off the plane – and my only solution so far has been to blow cigarette smoke right into its face. Is it my unrest or really just a bad habit I can’t get rid off? Or is it the same in the end? Few things feel better than standing on top of a mountain that you’ve just hiked up. 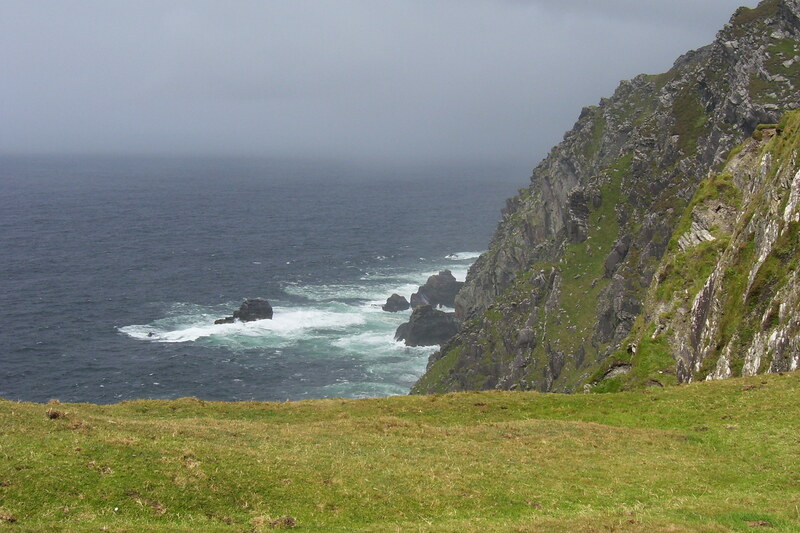 Especially with the soft, leprechaun-green Irish grass beneath and the dark blue of the Atlantic ocean below your feet. Also, few things feel more awe-inspiring. One moment of negligent curiosity and you’re sleeping with the fish – or you find yourself inside one, meeting Pinocchio or Jonah, potentially. There are some rocks – the Skelligs – an hour-long boat ride from the Irish coast, we wanted to but in the end couldn’t climb up. Weather conditions made it too dangerous and thus impossible (let alone our personal condition after the boat ride – the sea was a bit rough that day; go figure the consequences). They are mostly famous because around 600, Christian monks built their monastery on top of the rocks. In fact, they built them from the rocks. I still cannot imagine how they managed to do that. How they defied nature like that. And how they defied it and yet somehow still respected it, worked with it really (instead of marching in and just destroying everything, like it seems to be in fashion these days – sorry the tiny environmentalist in me sometimes takes over, but it’s a funny and cute creature, I’m sure you’d like it. Kind of like the Lorax, just maybe not that fuzzy). 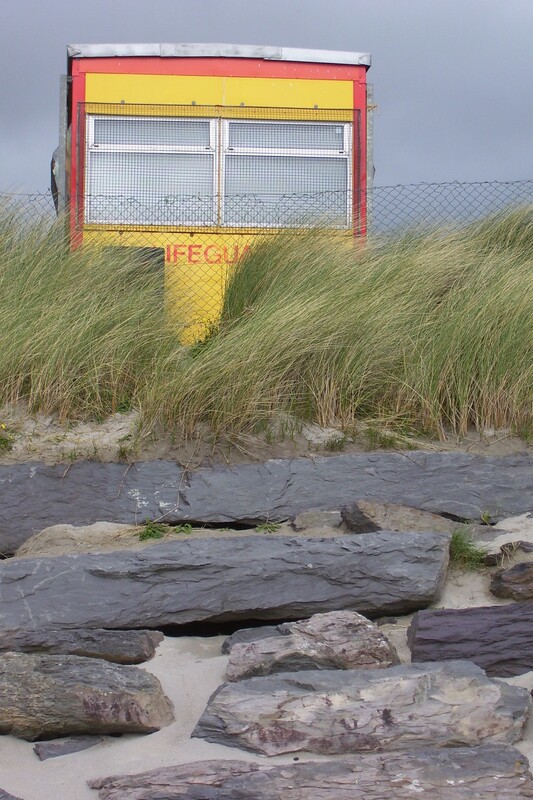 Lifeguards – in case a sailor is lost in the sea? Epilogue: Home from the Sea. I would have liked to stay longer (as always), but I’m back. And (as always), I feel more restless coming home than I do while traveling. Maybe I was a sailor in a former life (although then, I probably wouldn’t have become that seasick during the boat ride?). 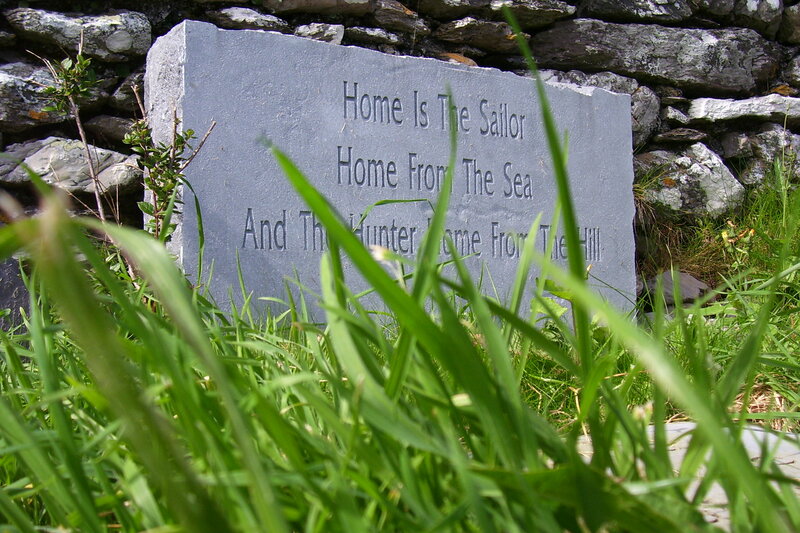 Home is the sailor, home from the sea – I found this quote on a gravestone in a small cemetery on a hill right next to the ocean. I really liked it and I took it home with me (okay, this is a metaphor but I also, literally, took a picture of it). Another option: maybe we’re all sailors and my chronic disease isn’t just chronic but also contagious and already wide-spread. The New Year (capitalized, to show it’s genuine importance!) is already a week old by now and therefore slowly taking off all the holiday make-up and fancy clothing – a very un-magical moment. It’s always a moment that leaves me missing things: all the Christmas lights, the smell of cinnamon and the anticipation in the air. Because, of course, by that time I’ve already pushed aside the rush and grumpiness of the few days before Christmas, along with the exhaustion of the let’s-visit-the-entire-family-and-all-of-our-friends-in-less-than-24-hours-marathon (while, year after year, thinking: how sweet it would be to catch a ride on Santa’s sleigh). However, what is even worse is the feeling when there’s someone you can’t visit, for whatever reason. Then, the missing hits in early – an even less magical feeling. The least magical I can imagine. This Christmas season, the missing did hit me quite early, it just snuck up on me behind my back and suddenly there it was, rearing its ugly head out of a pile of Christmas wrappings. It’s been living with me ever since. I don’t mean to complain, I’ve been wanting a roommate since I moved into a new apartment last summer (but I’d really prefer someone less sneaky, Santa must have gotten me wrong there…) leaving behind three roommates (a school, a city, a country) in the process – coming back to what I’d left behind a year earlier to find that I couldn’t have it all back, not the way it was. Of course, you never can – but, of course, you always hope. I think, it might have been already then, that this idiotic thing moved in with me, hiding in my luggage – the little parasite. Or maybe, I brought it with me from my holiday visit to one of my beloved roommates a few days ago. Anyhow, I’m planning to kick it out soon. I think, it has to go with the decorations and the last bits of candy (ha! I ate the last cookie this morning!). It’s really a poor replacement for all I’ve left behind. I know: it comes like breathing – unconsciously and delicate. Say, is it dancing, can you feel your heart dancing? you’re only imagining things, always. It’s tiring, truly exhausting – and there’s nothing that can be done. I’m afraid it’s not a mood, it doesn’t come and go like seasons do. It’s a state, it’s something chronic – the diagnosis? Well, it’s not yearning, it’s less dramatic; nothing emotional, I think. Thoughts upon a train ride: a place where you belong – home? But, about 5 minutes earlier, it had turned out that I was wrong. I was sitting in the wrong seat of the train. After a confusing journey through several cars – always carefully (neurotically) checking the car number to find out where in this train I actually was – I seemed to be running out of them: I was in car 32 and I needed number 24. Looking ahead, there didn’t seem to be an awful lot left. I was, in fact, being short of train. My reservation (car no. 24, seat 41) – that had cost me almost 5 euros extra – seemed quite useless. Then, I decided to just opt for seat 41 of the car I was standing in. I thought, that was my best option. At least, until a girl at the next train stop claimed to be the actual owner of the seat I had grown fairly attached to within the last hour or so. So I got up and went (again) looking for the seat that belonged to me and that I belonged to. First, I decided to find out how much train there was actually left and whether, possibly, someone might just have made a mistake when they assigned the numbers to the cars – something like, here goes 33, 32, 31 and last but not least: 24! 24 does come after 31, right? Well, in reality and my train, it sure didn’t. After 31…came nothing. I headed back in the other direction, slightly grumpy, a little disoriented and very confused. Then (in beautiful car no. 31) I spotted a seat that didn’t seem to be reserved to anyone yet. It was completely and utterly free and didn’t belong to anyone. So, I decided right then that it would belong to me. Or maybe, that I belonged there. I sat down and that was that. Sometimes the places we think are calling us, they’re not actually where we belong. And sometimes, while trying to find them, we end up somewhere else and it’s unexpected, but it feels right nevertheless. That home wasn’t really a place. As I was sitting (finally sitting) in my lovely train seat, I was again thinking about that: There’s no place like home? And what was that anyways: home – the place we (think we) belong to? So in my case at that very moment, it would have been my seat. It felt comfortable enough. A bit of background: I was taking the train to visit another friend – it’s safe to say one of my very best friends. We’ve known each other for close to ten years (wow, I’ve never done the math here) and she knows me better than most people. She’s someone I can tell all my dark and/or silly secrets knowing she won’t judge me. I can get drunk or smoke too many cigarettes or get up in the morning looking how you do when you get up in the morning knowing she won’t judge me. She just lets me be. She gets me to stand still. She gets me. So going to see her: it, in fact, felt like going home in a way. As if someone or something was reading my restlessness from my train ticket or whatever: When I was heading home, my train was late due to some construction work on the tracks – I missed my connecting train, the last one to leave the station for the night. By then, it was about 11 pm. To say I was a bit angry about that is a huge understatement. I steered towards the service point (to the big dismay of the lady sitting inside the booth) and told her the story. I would have liked to do some yelling, really, but I didn’t, because I knew the people who deserved the yelling in the first place were lying in their cozy beds right then – unlike the lady here and me, involuntarily night owling in the train station. She placed me in a hotel nearby for the night and handed me the information for possible trains I could take the next morning. So I was staying on the road for a bit longer. And although I was angry, because my plans for the next morning were being messed up (like going to university – things you’d do on a Monday morning unless you miss your train), I didn’t really mind not sleeping in my own bed for another night. Now, it’s 6:30 am and (finally), I’ve been sitting in my (next to last) train home for about an hour. Hopefully, I’ll be able to catch my connecting train for once (I do have the generous amount of 7 minutes to do so, which I’m absolutely thrilled about). If I had more time on my hands, I wouldn’t mind doing the extra traveling, in fact. I find it soothing – the very act of moving (on a train, bus, plane) gives me a comforting feeling. Like it’s okay to be a little restless. While being on the road, there’s no need for any attachments after all. It’s normal not to feel at home. Because you’re not. And yet, I feel more at home on a train, bus, plane at times, than anywhere else. Whoever finds some irony in any of the statements above – well, keep it. Once upon a time: Two fairy tales. I stick to her like a growth. wormed my way into her. now all she is: limestone and brittle. salty tears, the entire Dead Sea. you wanted to drown yourself. What were you afraid of, Virginia? afraid of – are you afraid of the Wolf? home while you’re blinded by luna. Say, what are you afraid of, Virginia? really hiding in the thicket. to yourself, I won’t come back. Now, will you tell me your secret? What are you really afraid of, Virginia? I am afraid of the Wolf. a little dignity and belief, a lighter. Taking over my seat in the bus, it is mine.